Tehran says the US is seeking to wage a “psychological war” on Iran by imposing the country with illegal sanctions in a bid to hurt its economy and cover up Washington’s own crimes against Middle Eastern nations. According to Press TV, Foreign Ministry Spokesman Bahram Qassemi made the remarks on Tuesday in response to US Secretary of State Mike Pompeo, who had claimed in a tweet that the Iranian economy is in decline, and that the Islamic Republic “steals from its people” to invest in the Damascus government. The top US diplomat was referring to the Iranian military’s advisory assistance to Syria in its fight against Takfiri terror groups, many of which have the support of Washington in their bid to topple the Damascus government. The Iranian economy has, contrary to Pompeo’s claims, seen a growth of more than 8 percent over the past years, at the same time that Tehran has been on the frontline of counter-terrorism battles, the official added. He also said Iran’s anti-terror fight and peace efforts in the region as well as firm defense of its borders have raised worries among US officials, and dealt a blow to their hostile agenda against the Islamic Republic. “The American officials are seeking to find a pretext to cover up their crimes against the people in the region and Iran, using economic terrorism and oppressive and illegal sanctions as a tool,” he said. They are trying “to launch a psychological war [against Iran], turning a deaf ear to international reactions as well as criticisms of the US’s confrontational and inhumane sanctions from countries and human rights institutions,” he added. 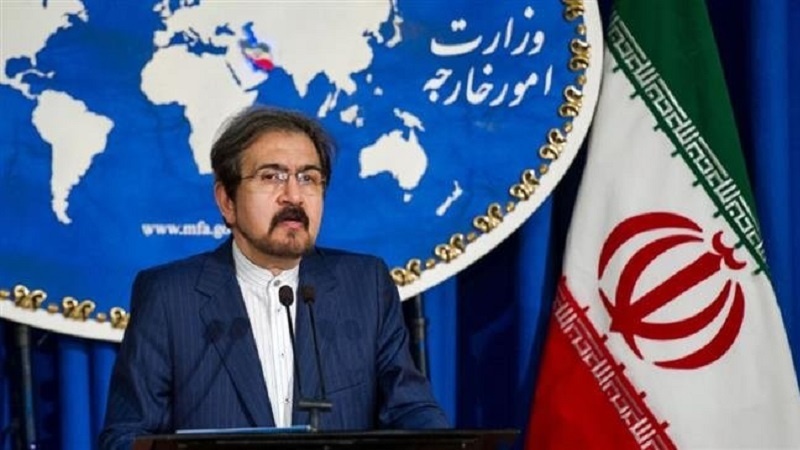 The Foreign Ministry spokesman added that the administration of US President Donald Trump is committing yet another “strategic mistake” by pursuing “deceptive” anti-Iran policies, which are based on the “hollow dreams” of certain “isolated and notorious” regimes, figures and terror groups. Pompeo’s tweet came as a second round of US sanctions is about to return in place against Iran months after Washington scrapped a 2015 multilateral deal on the Iranian nuclear program despite international objections. Iran has vowed resistance in the face of Washington’s economic pressure. It is now in talks with its other five partners in the deal – France, the UK, Germany, Russia and China – to help keep the international document alive and blunt the impact of the retuning US bans.